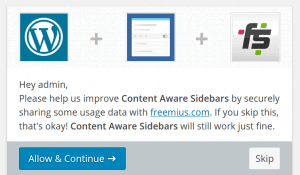 When activating Content Aware Sidebars on a WordPress site for the first time, you’ll be prompted to opt-in to Freemius or skip. Enabling it will help to improve Content Aware Sidebars by securely sharing some usage data with Freemius. It’s okay to skip it, and the plugin will still work just fine.